Sweet fact: India, the world’s largest sugar consumer, has turned into a net exporter from a net importer due to increase in production. London: The world is awash with sugar stocks after an overexpansion of the processing industry, and prices of the sweetener are set to remain depressed in 2008. According to the United Nations (UN) food body, world sugar output in 2007-08 (October-September) may reach 169 million tonnes (mt)—about 12mt higher than the projected demand of 157mt. “Until the last quarter of next year, I think that, based on fundamentals (supply and demand), there is nothing rosy at all (in the price outlook)," Sergey Gudoshnikov, a senior economist of the International Sugar Organization (ISO), said. “The sugar fundamentals do not provide any support." Now, international sugar prices are too low to cover costs in all major producing countries except Brazil, the world’s largest exporter, the Rome-based FAO said in its Food Outlook report. “The price outlook for 2007-08 has been dimmed by preliminary estimates that indicate world sugar production could surpass consumption by as much as 12mt, for the second consecutive season," FAO said. “For the remainder of 2007-08, world sugar prices are expected to remain weak." In August, ISO put world production 10.80mt higher than global consumption. 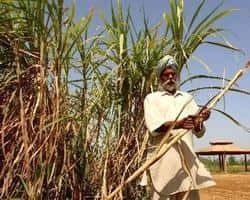 The market focus is India, the world’s largest sugar consumer, which has seen a huge increase in production, turning it into a net exporter from a net importer. India’s exportable surplus in 2007-08 is expected to top 10mt for the second year running, which is further aggravated by the current high level of stocks, ISO said. ISO’s Gudoshnikov said he expected India to export 3.5-4.5mt in the marketing year from October to September 2008. “It has been reported that India’s storage facilities are filling up quickly, with quantities of up to 9mt of white sugar being stored in overflowing warehouses and temporary storage already being used," ISO said.